Range anxiety could soon be a thing of the past if a Dutch project to create a sustainable under-road electric vehicle charger comes to pass. Range anxiety is the emotion felt by electric car drivers who fear their vehicle won’t make it to the nearest charge point before it runs out of battery power. The Electric Priority Lane would charge the car as it drives along the roadway using induction coils layered under the tarmac. It’s just one part of the Smart Highway project from designer Daan Roosegaarde and civil engineering firm, Heijmans. They are describing the project as ‘an innovative concept for smart roads of tomorrow’ with the focus on the road rather than on the car. Safety and sustainability are key in this multi-aspect project, which also includes glow in the dark road markings and innovative lighting. The Electric Priority Lane is not a world first in under-road charging – the South Koreans already have a 12km EV charging bus lane. However, while under-road charging is largely seen as a showcase technology in South Korea, the Dutch hope to make it commercially viable. A spokeswoman for Heijmans said that the EV charging lane is at an early stage. While she would not be drawn on details, she said it is its ambition to develop it from concept to ‘ready-for-market’. The first part of the Smart Highway project, Glowing Lines, is currently undergoing real life testing on a 500m stretch of road on the N329 in the Netherlands. 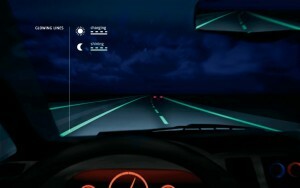 It uses photoluminescent paint, which charges during the day and can light roads for up to 10 hours at night. This saves energy as overhead lighting is not needed on little used roads. The Heijmans spokeswoman said that weather issues can be surmounted by attaching a solar panel which ‘maintains the intensity and lighting duration of the lines irrespective of the weather and season, or of the quantity of (sun)light and the length of the associated day or night’. She added that the project has received positive feedback from drivers but real life testing has thrown up issues with moisture from rainfall. This will be addressed in Glowing Lines version 2.0, which, she said, will be ready for the summer. There are then plans to introduce it on a larger scale in the Netherlands and further afield. The Glowing Lines aspect is the most developed of the Smart Highway project and there are plans to roll out further pilot projects over the next two years. Sustainable lighting is another important part of Smart Highway. 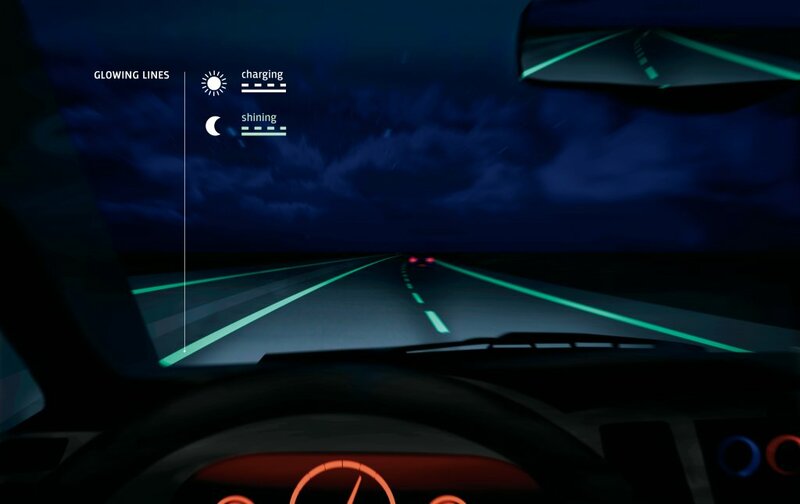 In one instance, interactive lights illuminate when vehicles approach and automatically turn off when the car has passed. And windlights get energy from roadside pinwheel generators, lighting from the draft from passing cars. 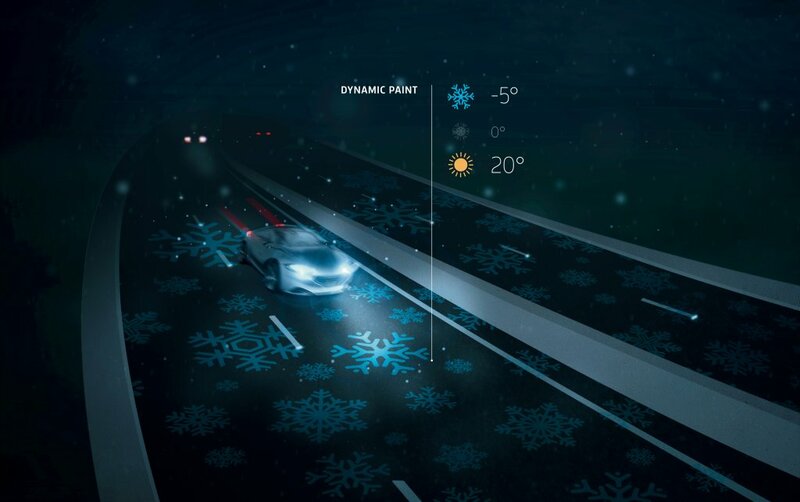 Meanwhile, for winter driving, temperature responsive paint shows ice crystals on the road when temperatures fall below freezing. Daan Roosegaarde said he believes these ideas could be implemented within five years. Speaking to CNN about the project, he said: ‘These are not ideas which are super high-tech, which we could implement to existing roads within three to five years. ‘Smart Highway is not just about new technologies and new designs it’s about creating new mental maps – pushing people to think about the future instead of the past.